Where is my body? – In the middle of the night aliens came and took my fabulously healthy body and replaced it with the broken down body of the centenarian. A not very healthy one! Oh yeah, my fabulously firm arms were replaced with flab too. Here is a health update. I’m fine. My teeth are recovering. My virus is gone. I wretched my back but that’s on the mend too. I’d love more than one day of feeling healthy though. Speaking of bad backs – We are a very physically active family and often have sore muscles and boo-boos. I was first introduced to ultrasound therapy (no, not the picture-taking kind) after hand surgery several years ago. It breaks up scar tissue and helps heal. We invested in a home model which is far cheaper than getting treatments outside. Best idea ever! The tooth fairy! – My cat Mollie had dental surgery a few weeks back. Two teeth were removed. She was very surprised when the tooth fairy aka Ellen from 15andmeowing sent a package. As is often the case in this house, youngest cat Gracie ran off with the biggest catnip toy but there were more than enough to go around. Thanks Ellen! Dazed cats send furry purrs. A beautiful time of year – Leaves are fully flushed out (finally) and buds are blooming. June is a beautiful time of year where I live. Many of the perennials do their first flush of flowers. Maybe it’s because it’s always a long dreary winter but when this time of year comes, everyone goes a little nuts. And Mother Nature is off her meds again – Despite the beauty, we continue to have 30 degree temperature swings. After two delightful days bumping near 90 degrees (which the forecasters were wrong about) today has dawned cold, cloudy and windy. The older I get the more the cold bothers me. Maybe this is why old people move south. I swear my bones are on Travelocity daily looking for cheap flights. This entry was posted in Aging Gracefully, For Animal Lovers Only, Health, Humor, Random Five and tagged cats, flowers blooming, Health, Mollie, temperature swings, tooth fairy, ultrasound treatments, weather by Kate Crimmins. Bookmark the permalink. HA! And as we moan each summer’s heat gets more difficult to tolerate and perhaps relocating a little more towards cooler climates. We crave nightly cool downs…knocks some of the heat out of the concrete. Glad you are chewing and moving more back to normal. Such a nice cat surprise is bound to help…if the cats’ are happy, everyone’s happy! Nominated you for a pet blogger award on http://daisymae2017.wordpress.com . I relate to your odd physical pains that seem to manifest from nowhere. I’m always torn between taking a Tylenol or sipping a glass of wine. Both seem to work, it’s just that one is more fun than the other. How thoughtful of the vet to send catnip to Molly! Does your doctor ever send you a gift? June is also a beautiful time of year here. I love all the flowers and tender green leaves. Our state flower is the rhododendron, and they’re all in bloom in May and June. That’s when you notice brightly colored plants almost as big as the house that you didn’t even see during the winter. The catnip came from another blogger. My vet does give a small catnip mouse at an office visit. Well, two things; 1) I live in pain every day of my life. Some days are better than others. I’ve noticed how much worse the pain gets in the winter now that I moved out of Florida. I hated it there though. Don’t really want to go back in retirement. Not a fan of dry heat either. I wonder if Georgia or South Carolina would work in the winter. 2) The most important one which comes with a question. It’s funny that you should mention ultrasound therapy. It has really helped me at my chiropractor, but it’s soooooo expensive to continue going. Over the past couple of weeks, we’ve been considering buying a machine, and then here is your post. We have LOTS of medical bills we still have to pay off, partly due to my chiro appointments, my husband’s broken toe and the dog’s vet bill. After we pay these off (sorry for the TMI), we want to buy an ultrasound machine. My question is, do you have a recommendation? We don’t know which brand or “power wattage” to buy. We were ignorant too. I asked our chiro about it but he wasn’t any help in home machines. I wasn’t going to pay thousands for an industrial model. We ended up with LG Pro Series Elite Ultrasound based on reviews. We purchased last year and we like it. Our chiro says that our medical insurance does not cover ultrasound treatments which is crazy because they help. This is a way we can get them more frequently. We also use them when the injury is not so severe that we need to go to a doc. I am so sorry about your pain. I have had a series of health issues this spring and I know I am not my perky self. I tend to be short tempered and I’m working on that. I don’t know how people who have pain all the time manage it but you must. There is no choice. Good luck. I know what you mean about getting irritable. I can’t imagine what this pain will be like 20 years from now in my 70’s. But, I try not to think about that. Thank you for the information and for your kind words. So glad you’re having good days – I’m there with ya about the cold! 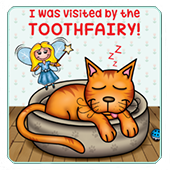 How cute is that, the tooth fairy visits! A whole new market for catnip toys! Glad molly is mending. Mollie bounced back better than when she was a young cat! Here’s too good days. I wonder if ultrasound therapy would help the husband’s very slow to mend ruptured quadriceps tendon? That would be nice. Do they use it in rehab for him? They didn’t automatically do it for me but I had a lot of pain from the scar tissue binding my thumb at the bend. I know stupidest thing ever! The doc had the rehab folks do it. It’s not a miracle but I could tell it helped a lot. He could ask. You could also google it to see if there are any reviews for his specific injury. We have a LG Pro Series Elite Ultrasound but it would be best to check with his doc first. I don’t think it’s with the scar tissue…but there’s so much scar tissue to when you reattach something like that, it could be anywhere, I guess. Too bad he can’t be specific! It’s worth asking about. It’s for more than scar tissue. Glad you are back and feeling healthy a day at a time. Thanks for the tip about ultrasound therapy. Sounds like a great gadget to have around. It is although it’s not cheap. I’m finding as I get older that “too hot” can really wear me down. Not at all. It’s my photo. They don’t look like that every year but that one is from last year and they were beautiful. I’m happy to hear you’re feeling better, Kate. I might have to check out that machine. What’s the brand name? Our weather has been horrid for the past three weeks, but I think after today, the tropical flow will move out and take all of this rain and extremely humid air with it. Have a great week! Sorry it took me a while be we have a LG Pro Series Elite Ultrasound which we like. You can check the reviews to see what people use it for. For our gardening injuries, we find it very helpful. Our chiro does it too but his hours are more limited. With our own unit we can do every day. I certainly here you on the strange weather. Although warmer down here in Florida, we’ve been on this rain kick for the last two weeks that just won’t stop. Each morning we wake up to sunny skies that give me hope, but by afternoon it’s coming down in sheets. Hope you start feeling better, Kate! I could use a good dose of sunshine! Yesterday we went to a Birthday Party for a Centenarian (who is also somewhat contrarian). Jack turned 100 this week and had 18 members of his extended family here to celebrate with him. They took it easy on the old man ~> only 3 candles to blow out: 1 – 0 – 0! I checked the long range weather report (because BFF wanted to head someplace a bit cooler for our 34th Anniversary next week). Turns out there isn’t any place cooler on the East Coast next week ~ in fact, most temps up and down the Eastern Seaboard are forecasted to be WARMER than here. In short ~> your warmer temps will be back SOON. I’d sure like warmer! Enjoy your celebration! What was that you said? “Centenarian?” Well, I wasn’t thinking that…I was more in the 90’s, but centenarian probably says it best. I have been literally crippled by my hips and knees. It came from no where, but I refuse, yes refuse to give in to my aches and pains. I really do believe mother nature and her VERY wet and cold spring has done this to me. I try to be kind to her, but she isn’t being particularly generous with me! Glad you are feeling better. We’ve seen very little of spring this year. Summer made a few attempts but not near enough. Sunshine! I need sunshine! Well, if your bones happen to book a flight out my way on the west coast, let me know. I glad to know that everyone is on the mend… now let’s keep it that way for a while! Glad to know you’re on the mend Kate. I had to laugh with the cat dentistry though. My niece collected the puppy’s baby teeth and put them under her pillow hoping the tooth fairy would visit and leave her some money. The tooth fairy did visit and left her a pile of dog biscuits! My niece thought she was being so clever……………..
Well, we got catnip toys. All good for the cats. Your hydrangeas are beautiful! When I was a teenager, I used to chuckle at grownup’s aches and pains. Now I know better! Me too. No laughing matter! Well, my body is moaning along with yours. When I told my friend Ed I’m not used to being chronically achey, he said, welcome to geezerhood. I hung up on him. I love the photo of flowers, and yes, Mother Nature could be Rosanne with her mood swings. I was cold today running, my legs in shock clad in shorts. I mean, hello, a minute ago I was sweating wiping my brow, so go figure. Getting Gracie to be mannerly is a lost cause. She will share though but always likes to be first. I chalked that up to youth! So glad to her that you are feeling better, Kate. And cool about Mollie’s Tooth Fairy – our world is filled with kind and thoughtful people! Yes it is. Sometimes they aren’t as close as you’d like but they do show up.